Premium wedding and event invitations. Handcrafted in Thailand, unique and special for your loved once and clients. This stunning wedding pocket folder was created by us earlier this year by using aqua blue silk and an embellishment of a extra large size rhinestone clasp creation from Europe. Hand-crafted as all our designs, highest quality standards and best look and feel you can imagine. used for both, wedding and event invitations. 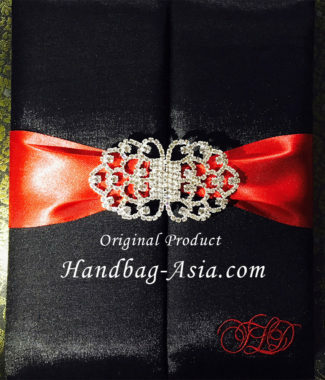 Featured in this creation are pocket holder and ribbon card holder on the inner part of the two door folder as well as the already mentioned huge rhinestone crystal clasp. the folder is opened in the centre part with two doors, can be locked with the elegant embellishment. Conor and size can be changed to whatever our clients desire. Get the best for your event and wedding guest, get luxurious wedding invitations and pocket folder by the PRESTIGE CREATIONS brand.